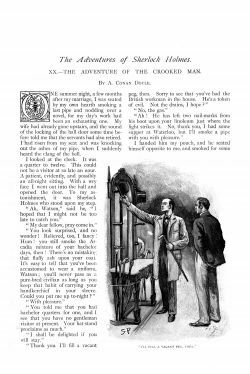 The Adventure of the Crooked Man (CROO) is a short story written by Arthur Conan Doyle first published in The Strand Magazine in july 1893. 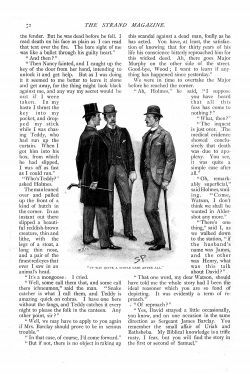 This is the 22nd Sherlock Holmes story. Collected in The Memoirs of Sherlock Holmes. I'll fill a vacant peg, then. The coachman rushed to the door. Mr. henry Wood, I believe? I walked right into six of them. It was quite a simple case after all. 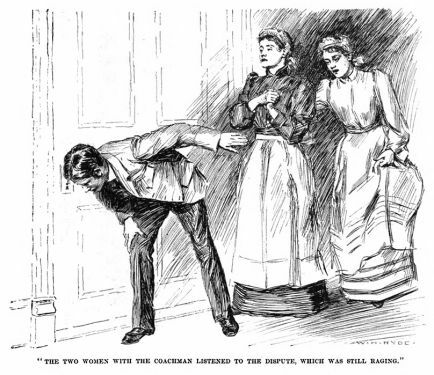 "The two women with the coachman listened to the dispute which was still raginig." "He was crouching over a fire, and the room was like an oven." 1984 : The Crooked Man (UK). Holmes : Jeremy Brett. Watson : David Burke. 1923 : The Crooked Man (UK). Holmes : Eille Norwood. Watson : Hubert Willis. 1992 : The Crooked Man. Holmes : Clive Merrison. Watson : Michael Williams. 1966 : The Crooked Man. Holmes : Carleton Hobbs. Watson : Norman Shelley. 1940 : The Crooked Man. Holmes : Basil Rathbone. Watson : Nigel Bruce. 1930 : The Crooked Man. Holmes : Richard Gordon. Watson : Leigh Lovell. 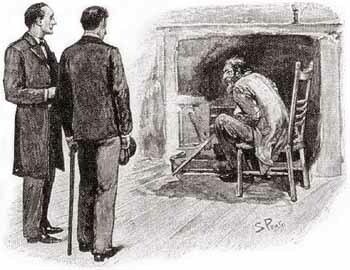 Holmes goes to Watson's house and tells him about the case he's working on. It is the murder of Colonel Barclay, commander of the Royal Mallows Regiment in Aldershot. Two days before, Mrs. Barclay had come home and had a fight with her husband. The servants, who were listening to the quarrel through the door of the small living room, heard a scream and then Fe silence. The driver tried to enter, but the door was closed from the inside, so he decided to go around the garden and came into the room through a French window. He discovered the colonel's body lying on the ground, stiff dead, and Mrs. Barclay passed out on the couch. His first reflex was to open the door to other servants, but the key was not on the door and could not be found. However, a club was found near the body and Mrs. Barclay was immediately suspected by the police. 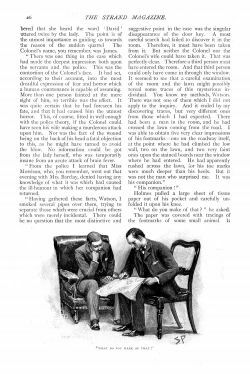 Holmes examined the house the next day and found the prints of an unknown man and a strange creature. 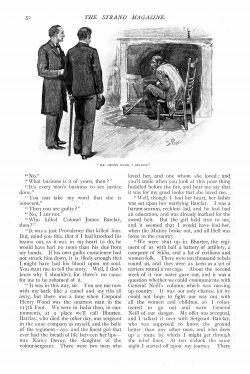 He deduced that the colonel was killed by the stranger, who took the key with him, or that the colonel fainted with surprise when he saw the man and died when his head hit the chimney tracks. 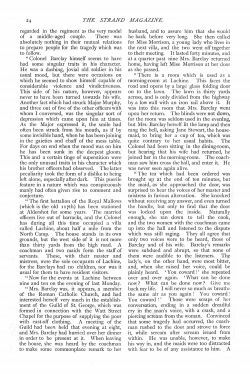 Miss Morrison tells Holmes that on the night of the tragedy she had met a stranger she did not know but who seemed familiar to Mrs. Barclay. 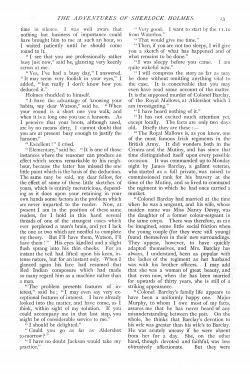 Holmes interviewed the man, Henry Wood, who had been a corporal in the same regiment as Colonel Barclay twenty years earlier. Both were rivals and coveted the same woman, Miss Nancy Devoy, the current Mrs. Barclay. During the Cipay revolt, when Wood volunteered to seek reinforcements across enemy lines, Barclay, then sergeant, advised him the way to go. Betrayed by Barclay, Wood fell into a trap and was imprisoned for years, suffering cruel abuse that made him deformed. Fortunately, he managed to escape and returned to England. When he met Mrs. Barclay in Aldershot, he told her about his sad adventure. Mrs. Barclay asked her husband for explanations and argued with him. When Wood appeared in the small living room the colonel fainted under the effect of surprise and killed himself in the fall. The strange animal, Wood's companion, was a mongoose. 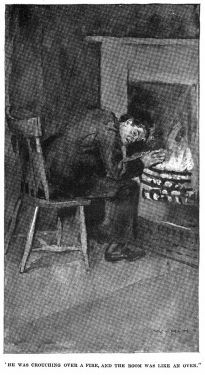 One summer night, a few months after my marriage, I was seated by my own hearth smoking a last pipe and nodding over a novel, for my day's work had been an exhausting one. My wife had already gone up stairs, and the sound of the locking of the hall door some time before told me that the servants had also retired. I had risen from my seat and was knocking out the ashes of my pipe, when I suddenly heard the clang of the bell. I looked at the clock. It was a quarter to twelve. This could not be a visitor at so late an hour. A patient, evidently, and possibly an all-night sitting. With a wry face I went out into the hall and opened the door. To my astonishment, it was Sherlock Holmes who stood upon my step. I handed him my pouch, and he seated himself opposite to me, and smoked for some time in silence. I was well aware that nothing but business of importance could have brought him to me at such an hour, so I waited patiently until he should come round to it. 'I see that you are professionally rather busy just now,' said he, glancing very keenly across at me. 'Elementary,' said he. 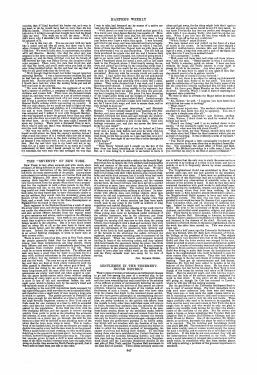 'It is one of those instances where the reasoner can produce an effect which seems remarkable to his neighbour, because the latter has missed the one little point which is the basis of the deduction. The same may be said, my dear fellow, for the effect of some of these little sketches of yours, which is entirely meretricious, depending as it does upon your retaining in your own hands some factors in the problem which are never imparted to the reader. Now, at present I am in the position of these same readers, for I hold in this hand several threads of one of the strangest cases which ever perplexed a man's brain, and yet I lack the one or two which are needful to complete my theory. But I'll have them, Watson, I'll have them!' His eyes kindled and a slight flush sprang into his thin cheeks. For an instant the veil had lifted upon his keen, intense nature, but for an instant only. When I glanced again his face had resumed that Red Indian composure which had made so many regard him as a machine rather than a man. 'The Royal Mallows is, as you know, one of the most famous Irish regiments in the British Army. It did wonders both in the Crimea and the Mutiny, and has since that time distinguished itself upon every possible occasion. It was commanded up to Monday night by James Barclay, a gallant veteran, who started as a full private, was raised to commissioned rank for his bravery at the time of the Mutiny, and so lived to command the regiment in which he had once carried a musket. 'Colonel Barclay had married at the time when he was a sergeant, and his wife, whose maiden name was Miss Nancy Devoy, was the daughter of a former colour-sergeant in the same corps. There was, therefore, as can be imagined, some little social friction when the young couple (for they were still young) found themselves in their new surroundings. They appear, however, to have quickly adapted themselves, and Mrs Barclay has always, I understand, been as popular with the ladies of the regiment as her husband was with his brother officers. I may add that she was a woman of great beauty, and that even now, when she has been married for upwards of thirty years, she is still of a striking appearance. 'Colonel Barclay's family life appears to have been a uniformly happy one. Major Murphy, to whom I owe most of my facts, assures me that he has never heard of any misunderstanding between the pair. On the whole he thinks that Barclay's devotion to his wife was greater than his wife's to Barclay. He was acutely uneasy if he were absent from her for a day. She, on the other hand, though devoted and faithful, was less obtrusively affectionate. But they were regarded in the regiment as the very model of a middle-aged couple. There was absolutely nothing in their mutual relations to prepare people for the tragedy which was to follow. 'Colonel Barclay himself seems to have had some singular traits in his character. He was a dashing, jovial old soldier in his usual mood, but there were occasions on which he seemed to show himself capable of considerable violence and vindictiveness. This side of his nature, however, appears never to have been turned towards his wife. Another fact which had struck Major Murphy, and three out of five of the other officers with whom I conversed, was the singular sort of depression which came upon him at times. As the Major expressed it, the smile had often been struck from his mouth, as if by some invisible hand, when he has been joining in the gaieties and chaff of the mess table. For days on end, when the mood was on him, he had been sunk in the deepest gloom. This and a certain tinge of superstition were the only unusual traits in his character which his brother officers had observed. The latter peculiarity took the form of a dislike to being left alone, especially after dark. This puerile feature in a nature which was conspicuously manly had often given rise to comment and conjecture. 'The first battalion of the Royal Mallows (which is the old 117th) has been stationed at Aldershot for some years. The married officers live out of barracks, and the Colonel has during all this time occupied a villa called Lachine, about half a mile from the North Camp. The house stands in its own grounds, but the west side of it is not more than thirty yards from the high road. A coachman and two maids form the staff of servants. These, with their master and mistress, were the sole occupants of Lachine, for the Barclays had no children, nor was it usual for them to have resident visitors. 'Now for the events at Lachine between nine and ten on the evening of last Monday. 'Mrs Barclay was, it appears, a member of the Roman Catholic Church, and had interested herself very much in the establishment of the Guild of St George, which was formed in connection with the Watt Street Chapel for the purpose of supplying the poor with cast-off clothing. 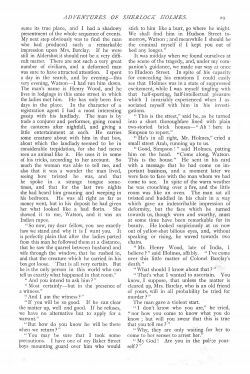 A meeting of the Guild had been held that evening at eight, and Mrs Barclay had hurried over her dinner in order to be present at it. 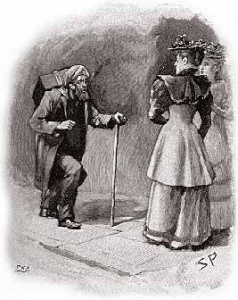 When leaving the house, she was heard by the coachman to make some commonplace remark to her husband, and to assure him that she would be back before long. She then called for Miss Morrison, a young lady who lives in the next villa, and the two went off together to their meeting. It lasted forty minutes, and at a quarter-past nine Mrs Barclay returned home, having left Miss Morrison at her door as she passed. 'There is a room which is used as a morning-room at Lachine. This faces the road, and opens by a large glass folding door on to the lawn. The lawn is thirty yards across, and is only divided from the highway by a low wall with an iron rail above it. It was into this room that Mrs Barclay went upon her return. The blinds were not down, for the room was seldom used in the evening, but Mrs Barclay herself lit the lamp and then rang the bell, asking Jane Stewart, the housemaid, to bring her a cup of tea, which was quite contrary to her usual habits. The Colonel had been sitting in the dining-room, but hearing that his wife had returned, he joined her in the morning-room. The coachman saw him cross the hall, and enter it. He was never seen again alive. 'The tea which had been ordered was brought up at the end of ten minutes, but the maid, as she approached the door, was surprised to hear the voices of her master and mistress in furious altercation. She knocked without receiving any answer, and even turned the handle, but only to find that the door was locked upon the inside. 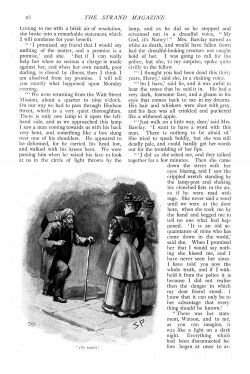 Naturally enough, she ran down to tell the cook, and the two women with the coachman came up into the hall and listened to the dispute which was still raging. They all agree that only two voices were to be heard, those of Barclay and his wife. Barclay's remarks were subdued and abrupt, so that none of them were audible to the listeners. The lady's, on the other hand, were most bitter, and, when she raised her voice, could be plainly heard. "You coward!" she repeated over and over again. "What can be done now? Give me back my life. I will never so much as breathe the same air as you again! You coward! You coward!" Those were scraps of her conversation, ending in a sudden dreadful cry in the man's voice, with a crash, and a piercing scream from the woman. Convinced that some tragedy had occurred, the coachman rushed to the door and strove to force it, while scream after scream issued from within. He was unable, however, to make his way in, and the maids were too distracted with fear to be of any assistance to him. A sudden thought struck him, however, and he ran through the hall door and round to the lawn, upon which the long french windows opened. One side of the window was open, which I understand was quite usual in the summer-time, and he passed without difficulty into the room. His mistress had ceased to scream, and was stretched insensible upon a couch, while with his feet tilted over the side of an armchair, and his head upon the ground near the corner of the fender, was lying the unfortunate soldier, stone dead, in a pool of his own blood. 'Naturally the coachman's first thought, on finding that he could do nothing for his master, was to open the door. But here an unexpected and singular difficulty presented itself. The key was not on the inner side of the door, nor could he find it anywhere in the room. He went out again, therefore, through the window, and having obtained the help of a policeman and of a medical man, he returned. The lady, against whom naturally the strongest suspicion rested, was removed to her room, still in a state of insensibility. The Colonel's body was then placed upon the sofa, and a careful examination made of the scene of the tragedy. 'The injury from which the unfortunate veteran was suffering was found to be a ragged cut, some two inches long, at the back part of his head, which had evidently been caused by a violent blow from a blunt weapon. Nor was it difficult to guess what that weapon may have been. Upon the floor, close to the body, was lying a singular club of hard carved wood with a bone handle. The Colonel possessed a varied collection of weapons brought from the different countries in which he had fought, and it is conjectured by the police that this club was among his trophies. The servants deny having seen it before, but among the numerous curiosities in the house it is possible that it may have been overlooked. 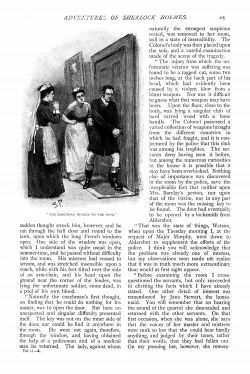 Nothing else of importance was discovered in the room by the police, save the inexplicable fact that neither upon Mrs Barclay's person, nor upon that of the victim, nor in any part of the room was the missing key to be found. The door had eventually to be opened by a locksmith from Aldershot. 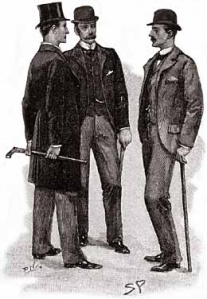 'That was the state of things, Watson, when upon the Tuesday morning I, at the request of Major Murphy, went down to Aldershot to supplement the efforts of the police. I think you will acknowledge that the problem was already one of interest, but my observations soon made me realize that it was in truth much more extraordinary than would at first sight appear. 'Before examining the room I cross-questioned the servants, but only succeeded in eliciting the facts which I have already stated. One other detail of interest was remembered by Jane Stewart, the housemaid. You will remember that on hearing the sound of the quarrel she descended and returned with the other servants. On that first occasion, when she was alone, she says that the voices of her master and mistress were sunk so low that she could hear hardly anything, and judged by their tones, rather than their words, that they had fallen out. On my pressing her, however, she remembered that she heard the word "David" uttered twice by the lady. The point is of the utmost importance as guiding us towards the reason of the sudden quarrel. The Colonel's name, you remember, was James. 'There was one thing in the case which had made the deepest impression both upon the servants and the police. This was the contortion of the Colonel's face. It had set, according to their account, into the most dreadful expression of fear and horror which a human countenance is capable of assuming. More than one person fainted at the mere sight of him, so terrible was the effect. It was quite certain that he had foreseen his fate, and that it had caused him the utmost horror. This, of course, fitted in well enough with the police theory, if the Colonel could have seen his wife making a murderous attack upon him. Nor was the fact of the wound being on the back of his head a fatal objection to this, as he might have turned to avoid the blow. No information could be got from the lady herself, who was temporarily insane from an acute attack of brain fever. 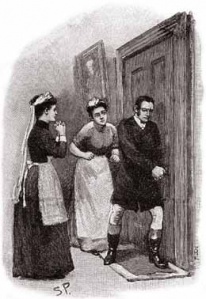 'From the police I learned that Miss Morrison, who, you remember, went out that evening with Mrs Barclay, denied having any knowledge of what it was which had caused the ill-humour in which her companion had returned. 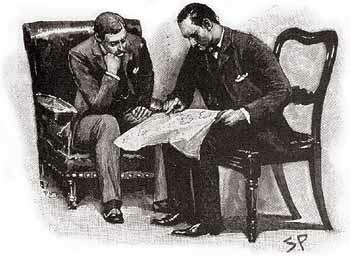 Holmes pulled a large sheet of tissue paper out of his pocket and carefully unfolded it upon his knee. 'What do you make of that?' he asked. The paper was covered with tracings of the footmarks of some small animal. It had five well-marked footpads, an indication of long nails, and the whole print might be nearly as large as a dessert spoon. 'It's a dog,' said I. 'Your discoveries seem to have left the business more obscure than it was before,' said I. 'It was quite certain that when Mrs Barclay left the house at half-past seven she was on good terms with her husband. She was never, as I think I have said, ostentatiously affectionate, but she was heard by the coachman chatting with the Colonel in a friendly fashion. Now, it was equally certain that immediately on her return she had gone to the room in which she was least likely to see her husband, had flown to tea, as an agitated woman will, and, finally, on his coming in to her, had broken into violent recriminations. Therefore, something had occurred between seven-thirty and nine o'clock which had completely altered her feelings towards him. But Miss Morrison had been with her during the whole of that hour and a half. It was absolutely certain, therefore, in spite of her denial, that she must know something of the matter. 'My first conjecture was that possibly there had been some passages between this young woman and the old soldier, which the former had now confessed to the wife. That would account for the angry return and also for the girl's denial that anything had occurred. Nor would it be entirely incompatible with most of the words overheard. But there was the reference to David, and there was the known affection of the Colonel for his wife to weigh against it, to say nothing of the tragic intrusion of this other man, which might, of course, be entirely disconnected with what had gone before. 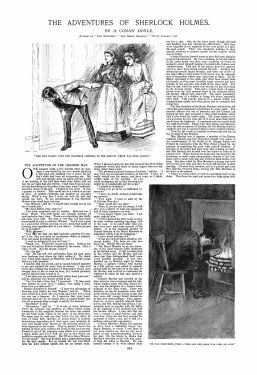 It was not easy to pick one's steps, but on the whole I was inclined to dismiss the idea that there had been anything between the Colonel and Miss Morrison, but more than ever convinced that the young lady held the clue as to what it was which had turned Mrs Barclay to hatred of her husband. 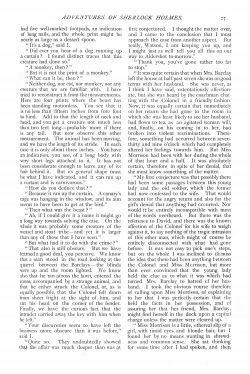 I took the obvious course, therefore, of calling upon Miss Morrison, of explaining to her that I was perfectly certain that she held the 'facts in her possession, and of assuring her that her friend, Mrs Barclay, might find herself in the dock upon a capital charge unless the matter were cleared up. 'Miss Morrison is a little, ethereal slip of a girl, with timid eyes and blonde hair, but I found her by no means wanting in shrewdness and common sense. She sat thinking for some time after I had spoken, and then turning to me with a brisk air of resolution, she broke into a remarkable statement, which I will condense for your benefit. '"I promised my friend that I would say nothing of the matter, and a promise is a promise," said she. "But if I can really help her when so serious a charge is made against her, and when her own mouth, poor darling, is closed by illness, then I think I am absolved from my promise. I will tell you exactly what happened on Monday evening. '"We were returning from the Watt Street Mission, about a quarter to nine o'clock. On our way we had to pass through Hudson Street, which is a very quiet thoroughfare. There is only one lamp in it upon the left-hand side, and as we approached this lamp I saw a man coming towards us with his back very bent, and something like a box slung over one of his shoulders. He appeared to be deformed, for he carried his head low, and walked with his knees bent. We were passing him when he raised his face to look at us in the circle of light thrown by the lamp, and as he did so he stopped and screamed out in a dreadful voice, 'My God, it's Nancy!' Mrs Barclay turned as white as death, and would have fallen down had the dreadful-looking creature not caught hold of her. I was going to call for the police, but she, to my surprise, spoke quite civilly to the fellow. '"'I thought you had been dead this thirty years, Henry,' said she, in a shaking voice. '"'So I have,' said he, and it was awful to hear the tones that he said it in. He had a very dark, fearsome face, and a gleam in his eyes that comes back to me in my dreams. His hair and whiskers were shot with grey, and his face was all crinkled and puckered like a withered apple. '"'Just walk on a little way, dear,' said Mrs Barclay. 'I want to have a word with this man. There is nothing to be afraid of.' She tried to speak boldly, but she was still deadly pale, and could hardly get her words out for the trembling of her lips. '"I did as she asked me, and they talked together for a few minutes. Then she came down the street with her eyes blazing, and I saw the crippled wretch standing by the lamp-post and shaking his clenched fists in the air, as if he were mad with rage. She never said a word until we were at the door here, when she took me by the hand and begged me to tell no one what had happened. 'It is an old acquaintance of mine who has come down in the world,' said she. When I promised her that I would say nothing she kissed me, and I have never seen her since. I have told you now the whole truth, and if I withheld it from the police it is because I did not realize then the danger in which my dear friend stood. I know that it can only be to her advantage that everything should be known." 'There was her statement, Watson, and to me, as you can imagine, it was like a light on a dark night. Everything which had been disconnected before began at once to assume its true place, and I had a shadowy presentiment of the whole sequence of events. My next step obviously was to find the man who had produced such a remarkable impression upon Mrs Barclay. If he were still in Aldershot it should not be a very difficult matter. There are not such a very great number of civilians, and a deformed man was sure to have attracted attention. I spent a day in the search, and by evening - this very evening, Watson - I had run him down. The man's name is Henry Wood, and he lives in lodgings in the same street in which the ladies met him. He has only been five days in the place. In the character of a registration agent I had a most interesting gossip with his landlady. The man is by trade a conjurer and performer, going round the canteens, after nightfall, and giving a little entertainment at each. He carries some creature about with him in his box, about which the landlady seemed to be in considerable trepidation, for she had never seen an animal like it. He uses it in some of his tricks, according to her account. So much the woman was able to tell me, and also that it was a wonder the man lived, seeing how twisted he was, and that he spoke in a strange tongue sometimes, and that for the last two nights she had heard him groaning and weeping in his bedroom. He was all right as far as money went, but in his deposit he had given her what looked like a bad florin. She showed it to me, Watson, and it was an Indian rupee. It was midday when we found ourselves at the scene of the tragedy, and, under my companion's guidance, we made our way at once to Hudson Street. 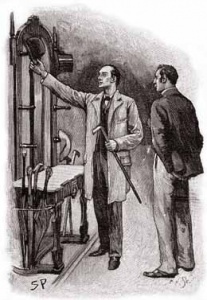 In spite of his capacity for concealing his emotions I could easily see that Holmes was in a state of suppressed excitement, while I was myself tingling with that half-sporting, half-intellectual pleasure which I invariably experienced when I associated myself with him in his investigations. 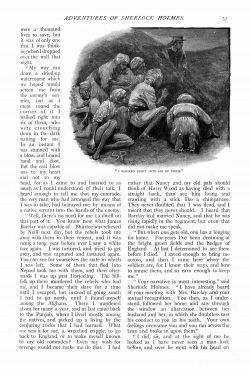 'He's in all right, Mr Holmes,' cried a small street Arab, running up to us. 'Good, Simpson!' said Holmes, patting him on the head. 'Come along, Watson. This is the house.' He sent in his card with a message that he had come on important business, and a moment later we were face to face with the man whom we had come to see. In spite of the warm weather he was crouching over a fire, and the little room was like an oven. The man sat all twisted and huddled in his chair in a way which gave an indescribable impression of deformity, but the face which he turned towards us, though worn and swarthy, must at some time have been remarkable for its beauty. He looked suspiciously at us now out of yellow-shot bilious eyes, and, without speaking or rising, he waved towards two chairs. 'It was a just Providence that killed him. But mind you this, that if I had knocked his brains out, as it was in my heart to do, he would have had no more than his due from my hands. If his own guilty conscience had not struck him down, it is likely enough that I might have had his blood upon my soul. You want me to tell the story? Well, I don't know why I shouldn't, for there's no cause for me to be ashamed of it. 'It was in this way, sir. You see me now with my back like a camel and my ribs all awry, but there was a time when Corporal Henry Wood was the smartest man in the 117th Foot. We were in India then, in cantonments, at a place we'll call Bhurtee. Barclay, who died the other day, was sergeant in the same company as myself, and the belle of the regiment - aye, and the finest girl that ever had the breath of life between her lips - was Nancy Devoy, the daughter of the colour-sergeant. There were two men who loved her, and one whom she loved; and you'll smile when you look at this poor thing huddled before the fire, and hear me say that it was for my good looks that she loved me. 'Well, though I had her heart her father was set upon her marrying Barclay. I was a harum-scarum, reckless lad, and he had had an education, and was already marked for the sword-belt. But the girl held true to me, and it seemed that I would have had her, when the Mutiny broke out, and all Hell was loose in the country. 'We were shut up in Bhurtee, the regiment of us, with half a battery of artillery, a company of Sikhs, and a lot of civilians and women-folk. There were ten thousand rebels round us, and they were as keen as a set of terriers round a rat-cage. 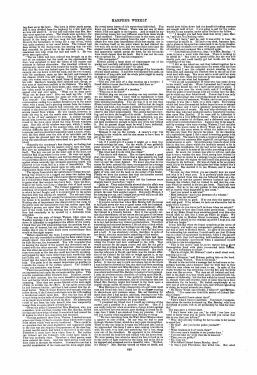 About the second week of it our water gave out, and it was a question whether we could communicate with General Neill's column, which was moving up country. It was our only chance, for we could not hope to fight our way out with all the women and children, so I volunteered to go out and warn General Neill of our danger. My offer was accepted, and I talked it over with Sergeant Barclay, who was supposed to know the ground better than any other man, and who drew up a route by which I might get through the rebel lines. At ten o'clock the same night I started off upon my journey. There were a thousand lives to save, but it was of only one that I was thinking when I dropped over the wall that night. 'My way ran down a dried-up watercourse, which we hoped would screen me from the enemy's sentries, but as I crept round the corner of it I walked right into six of them, who were crouching down in the dark waiting for me. In an instant I was stunned with a blow, and bound hand and foot. But the real blow was to my heart and not to my head, for as I came to and listened to as much as I could understand of their talk, I heard enough to tell me that my comrade, the very man who had arranged the way I was to take, had betrayed me by means of a native servant into the hands of the enemy. 'Well, there's no need for me to dwell on that part of it. You know now what James Barclay was capable of. Bhurtee was relieved by Neill next day, but the rebels took me away with them in their retreat, and it was many a long year before ever I saw a white face again. I was tortured, and tried to get away, and was captured and tortured again. You can see for yourselves the state in which I was left. 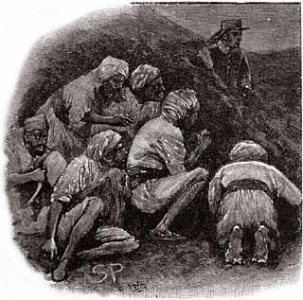 Some of them that fled into Nepal took me with them, and then afterwards I was up past Darjeeling. The hill-folk up there murdered the rebels who had me, and I became their slave for a time until I escaped, but instead of going south I had to go north, until I found myself among the Afghans. There I wandered about for many a year, and at last came back to the Punjab, where I lived mostly among the natives, and picked up a living by the conjuring tricks that I had learned. What use was it for me, a wretched cripple, to go back to England, or to make myself known to my old comrades? Even my wish for revenge would not make me do that. I had rather that Nancy and my old pals should think of Harry Wood as having died with a straight back, than see him living and crawling with a stick like a chimpanzee. They never doubted that I was dead, and I meant that they never should. I heard that Barclay had married Nancy, and that he was rapidly rising in the regiment, but even that did not make me speak. The man leaned over and pulled up the front of a kind of hutch in the corner. In an instant out there slipped a beautiful reddish-brown creature, thin, and lithe, with the legs of a stoat, a long thin nose, and a pair of the finest red eyes that ever I saw in an animal's head. 'It's a mongoose!' I cried. This page was last edited on 27 March 2019, at 22:28.